The image of a floor of dried brown leaves has bubbled into my consciousness now and again for over a year now. On walks I’ll often think of it. 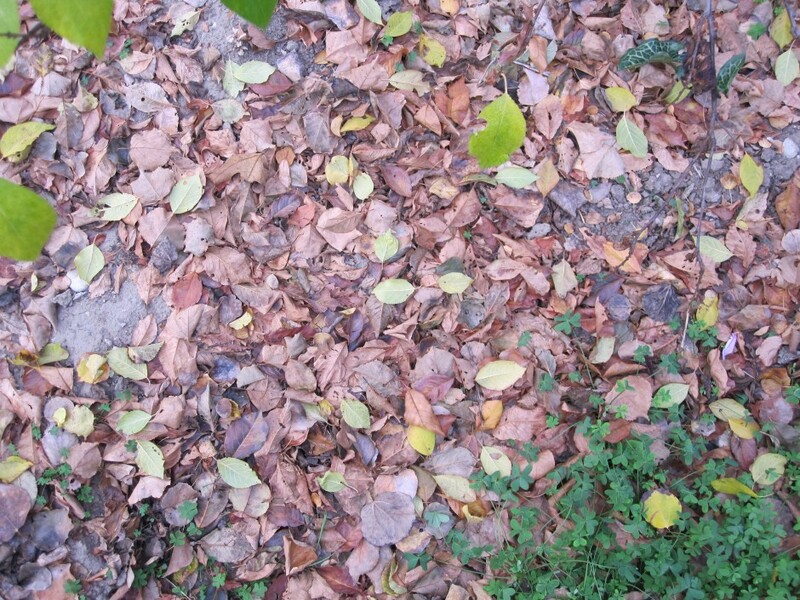 And especially when the seasons change and the leaves create a crunchy brown carpet on the garden floor. In between leafy greenness and specks of dust, the leaves are ephemeral, lifeless, dry. Like November Gutter Leaves, Pasadena, I want to freeze the moment somehow before they decompose and rot. 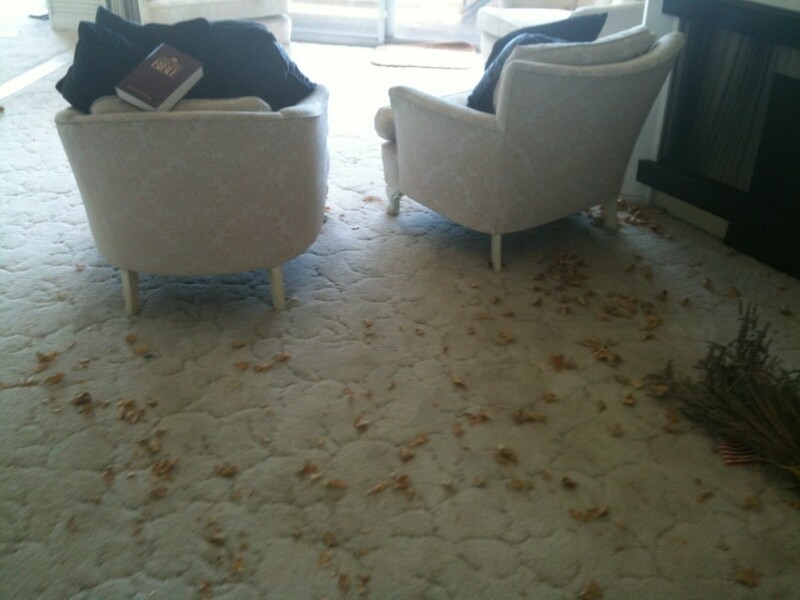 And then the other day over dinner my friend Christian Frock showed me pictures she took of a foreclosed home with dry brown leaves scattered everywhere. The previous owners apparently left with everything in it – including the houseplants. 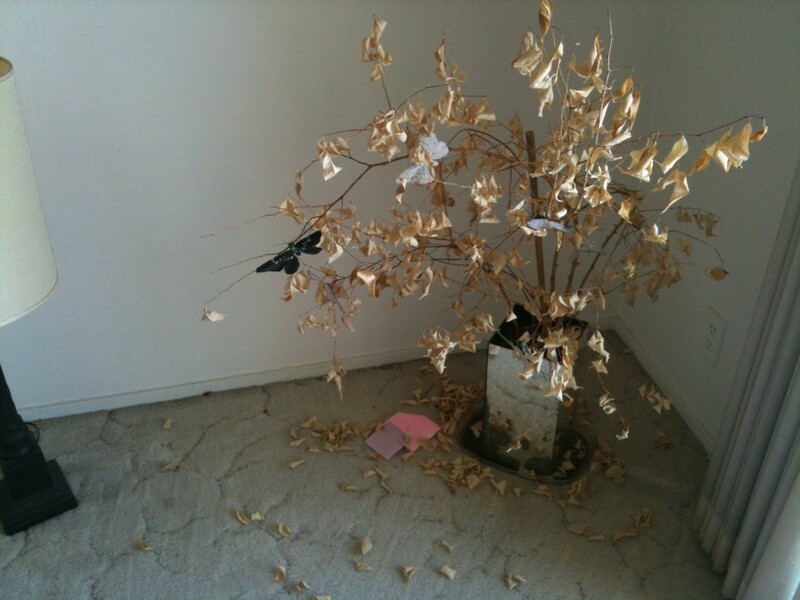 The houseplants are a fraction of the loss here, and like White’s installation, the dead leaves shift the scene to the uncanny and surreal. I love it when a work can be so simple in its execution yet evoke an emotional and personal response. For me, White’s constructed gutter leaves made of aluminum and canvas describe the stillness of loss, a tender and palpable space between grief and beauty. So now the sight of brown leaves allow me to hover in this emotional space, relish in it. Oddly it is affirming to be reminded of my own fragility, of our own fragility, really. Is there an artwork your mind returns to from time to time? This entry was posted on Tuesday, June 25th, 2013 at 7:04 pm	and is filed under Blog. Categories: Blog. Tags: art, inspiration, life, observations, and People. You can follow any responses to this entry through the RSS 2.0 feed. In my mind, I often return to artworks that have very little visible material presence — it took me a while to realize this, that the work I love the most is pretty much out of site. Max Neuhaus’ “Times Square” is one of these touchstones. No matter what time it is day or night, I know that “Times Square” is happening, even if no one around it knows its there. I am deeply inspired by this public work in one of the busiest spaces in the world, with no signage or markings, and its immersive audio field. If “Times Square” is possible, anything else is too.